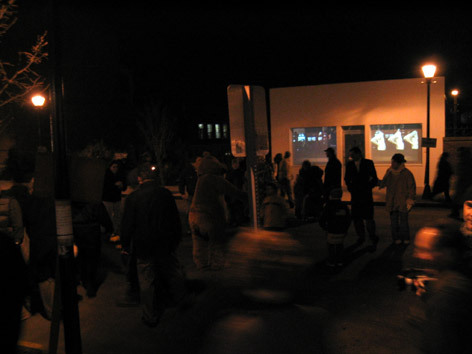 ‘Parade’ is an interactive cinema installation shown at the town of Hudson in New York on December 4th 2004. Between 4pm and 8pm, 10,000 people took part in a ‘Winterwalk’, during which time we projected on two windows of 330 U Gallery. ‘Parade’ is made from an exaggerated physiognomy, reacting to the movements of the passers by. Parade is part of a site-specific new media project called Third Person. 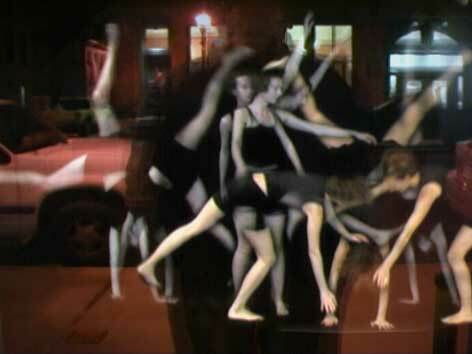 Example of collage with silhouette of pedestrian and video clip. Another of the exaggerated physiognomies. Opening night of the Winterwalk. Opening night of the Winterwalk. Installation reacts to and collages with the movement of pedestrians. Left, camera, computer and projector installation. Right, windows with sound transducers for sound. Parade is a part of Third Person, an interactive video installation that displays a site-specific cinematic narrative.